Psychotherapy and the problems it targets are fundamentally interpersonal, intrapersonal, and existential issues. They aren’t really about literal health and illness. Nonetheless, insurance companies have chosen to consider psychotherapy a “medically necessary” service. Therefore, people who otherwise could not afford those services out of pocket have resorted to their insurance benefits in order to seek out help. But the problem with this is that in order for insurance to pay, they have to be diagnosed with an invalid DSM diagnosis. Using an invalid diagnostic tool flies in the face of professional ethical guidelines. 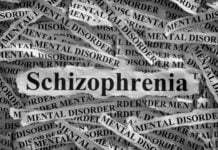 Of further insult above and beyond the question of validity, DSM diagnoses can also cause substantial harm, especially for young people. Employment opportunities, security clearances, and insurance eligibility can be jeopardized by having such a diagnosis in one’s health record. 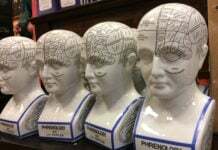 Moreover, these diagnoses create the impression of personal defect, which can seriously compromise one’s sense of self-worth, hope for the future, and others’ perceptions of the person so diagnosed, leading to social isolation and mistreatment. And keep in mind, this is all due to a label for an invalid construct. This places professionals in an ethical double bind. In order to work with people who choose to use health insurance benefits, the professional must provide a DSM diagnosis; a diagnosis known to be invalid and potentially harmful. If, on the other hand, the professional refuses to diagnose in order to avoid the harm, and precluding insurance coverage, then the consumer may not be able to afford badly desired help. In recognition of this ethical dilemma, ISEPP has drafted an open letter to four principal professional organizations in the United States, publicizing this concern and asking for ethical guidance. The draft of this letter is included below. ISEPP is soliciting other groups to join us in this letter. If your group is interested, and if you know of any other principal professional world-wide organizations that should receive this letter, please contact me at [email protected] or Matt Stevenson at [email protected]. We hope to have the letter sent by March 1st. Operation Speak Up: Dr. Ruby (USAF Lt. Col., Ret) is Executive Director of the International Society for Ethical Psychology and Psychiatry (ISEPP) and a member of Psychologists for Social Responsibility (PsySR). In 2012, Dr. Ruby resigned from the American Psychological Association in protest of their refusal to enforce the prohibition against psychologists’ involvement in torture. To other readers, if you know any organization or group that might want to endorse this petition, please contact me at bpdtransformation (at) gmail (dot) com – I am trying to help Chuck with this effort. Sorry, I don’t support oxymoron’s. I’m all for dumping the invalid DSM. But I can’t understand why DSM is almost never called out for its lack of reliability. DSM III was deemed reliable only after the APA lowered the bar for what constituted good reliability (and after smoke and mirrors testing of reliability). DSM IV was still less reliable, and DSM 5 was just the pits. Why is this never stressed, when common mental problems have inter-rater reliabilities in the 20, 30, 40 and 50% range, and only a few “disorders” approach 70%? Letting the APA (and the rest of the “mental health” industry) off the hook on this only helps them maintain their “scientific” facade. Great Idea. 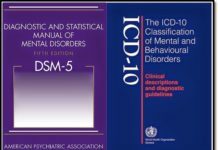 Good Luck.The DSM was only supposed to be a codifying tool with the use of symptoms that never were based on anything scientific in the best sense of the word. It was all about human being ‘s observations of other human beings with a nonegltarian bent.The observer had ultimate control of the observed. There was as in all medicine a silent agreement that this relationship and balance was in the best interest of the patient. people yielded to this relationship with the hope that the entire ethics of the Hippocratic Oath would be abided by. If one was lucky with being at the right place – at the right. time – with a ethically good person. One may have been helped. Ultimately many, many folks were not. The idea of trauma and sense of true medical ethics was smashed. 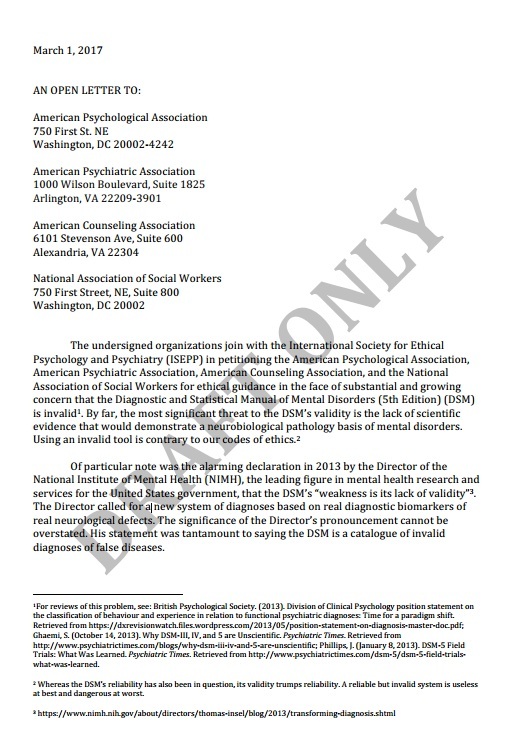 I absolutely agree, continued use of the DSM is unethical, it’s been unethical since 2013. 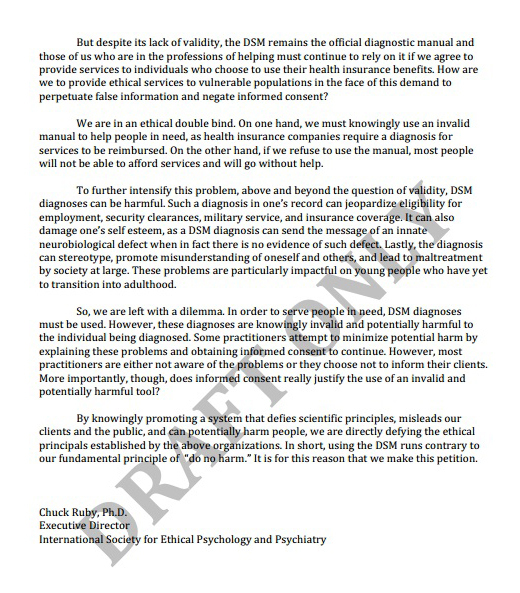 I also agree with CatNight that with the DSM the psychiatric industry has betrayed humanity once again, and broken their Hippocratic Oath, to first and foremost do no harm. To that point, when I asked my last psychiatrist about the Hippocratic Oath, he acted like he’d never heard of it, and it didn’t apply to him. Of course, you can’t continue to see a doctor who harbors such delusions of grandeur. I hope the psychological and therapy fields will choose to distance themselves from the deplorable and fraudulent DSM, and that the insurance companies will some day wake up to the reality that requiring a scientifically invalid DSM stigmatization for payment of “mental health care” services is also unethical on their part. You may want to send that letter to the medical insurance companies, as well? Since I do know for a fact that the health insurance company employees were completely deluded by their belief that the DSM disorders were real diseases back in 2010. And if they’re still paying for the DSM disorders, they may not have been informed of Insel’s confession of the scientific invalidity of the DSM disorders. I understand the usefulness of this approach as an incremental internal assault on the medical model. Still the tactic of appealing to the industry to in essence invalidate its raison d’etre seems doomed to failure. As an educational tool it could help though. We the survivors must reject all forms of Psychiatry, Psychotherapy, Recovery, Healing, and Life Coaching. We must organize and take legal and political action. The model we should follow is that of the Black Panthers. What Recovery means is that the client agrees to live in an unjust world and abandon all hope of justice. So what we should be doing is suing parents. But it is easier to get people to sue their psychotherapists. Now eventually we also want people to see that all therapy is inherently abusive, and to reject it. So refer all Mental Health and Recovery Survivors to ME. I’ll find them a lawyer.